1 of 2 Combine couscous, 1 1/4 cups water and 1 tsp of the oil in a small pot and bring to a boil. Cover, remove from heat and set aside. 2 of 2 In a bowl, toss beef with flour, cumin, ginger, cinnamon, 1/4 tsp of the salt and the cayenne. In a large skillet, heat 1 tbsp of the oil over medium-high heat. Saute beef 2 minutes and remove to a plate with a slotted spoon. Pour remaining 1 tbsp oil into skillet and add onion; saute 2 minutes. Stir in tomato sauce, broth, chickpeas, apricots and dates. Bring to a simmer. Reduce heat to medium-low and cook 10 minutes. Stir in cooked beef, parsley and remaining 1/4 tsp salt. 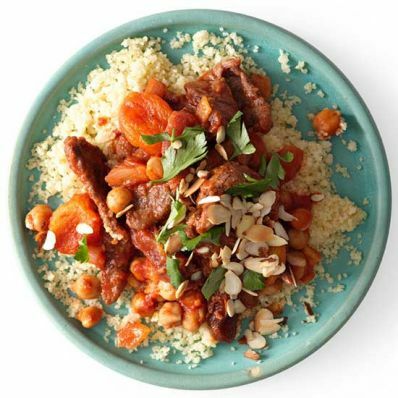 Serve over fluffed couscous and garnish with almonds.